Okay, I think I need a break. A continuous headache that I had after my trip to Togean Islands was killing me – my mood and my mind. I couldn’t focus on doing whatever I need to do. Neither sleep nor eat helped. I let go of what my mind and body wanted me to do even though it’s not good – eating junk foods. For that moment, I just want to be able to calm myself down, back on track, and solve the issues I needed to. Then I saw the one-day dive trip to Seribu post from Living Seas when I scrolled through my Instagram feed. I thought that maybe it can help to get my mind out from all the chaos and get myself refreshed a little. Coincidencely, it fell on August 25th which was exactly a year since I got certified. Then I thought, “Hmm..let’s do this!” So, I signed up two days before the actual day. I didn’t put many expectations. I just want to take a break by doing something I hardly have a chance to do and also I wanted to see whether I have felt much better in the water after a year taking the course, in the same place. I reached the meeting point, Jetski Cafe, at around 7 am as I was told. After setting up the gears and so on, I still had some time to walk around. I noticed that every time I plan to go to Seribu, whether the night before or in the early morning, it always rains but that day was a sunny day. I heard someone was talking from afar. “Ooh, briefing…” Quickly I walked over and joined them in the restaurant. “..but coral planting? Oh, so we will do some coral planting later? How to do? Ermm…Okay…should be okay. I will just follow their instruction.” I was talking to myself while listening to the briefing session. I often do that. Don’t be surprised. Besides the two open water students who also joined the trip for their open water test, I think I was the most inexperienced one. I remember someone asked me where I usually go diving and I was like, “Ermmm…..” I paused for quite long before I answered, “Depends on where I go.” That answer didn’t even actually answer the question and maybe sounded kind of arrogant instead which I hope the person didn’t think it that way. And when I and another girl were waiting for the rest of divers to come on our 2nd dive, we chatted a little. She asked me if I often go diving. I said that not often, only about 13 to 14, I just started a year ago. From her facial expression, I was sure that she has mistakenly it as 13 to 14 dive trips in the past one year which I made it clearer later on that I meant dives, not trips. That 13 dives can be achieved easily in one dive trip, I believe. That’s a huge difference – as huge as my love to you all. We did three dives during this one-day dive trip to Pulau Seribu. And on the second dive, we did the planting at Sekati Island. As what we were told during the briefing, the first thing we need to do is to collect broken corals that still alive but dead on the end – white colour on the bottom part. Although we said that we plant corals, the fact is corals are not plants. Corals are animals. It is hard to believe if only by looking at its form and shape. I thought they are plants until last year when I saw one of my friends posted about this on her Facebook. From what I found online, the explanation goes like this. The branch or mound that we often call “a coral” is actually made up of thousands of tiny animals called polyps. A coral polyp is an invertebrate that can be no bigger than a pinhead to up to a foot in diameter. Corals actually comprise an ancient and unique partnership, called symbiosis, that benefits both animal and plant life in the ocean. Corals have tiny, tentacle-like arms that they use to capture their food from the water and sweep into their inscrutable mouths. They have MOUTHS. I never expect that. The water visibility that day wasn’t that good. I needed to try a bit harder to look around because I wasn’t sure which one I should pick – alive but dead on the bottom. Wrong pick or pluck, then I would just kill another one. Then suddenly someone handed me a bunch of corals and also to a few others. I guess they knew we were kind of confused and lost. Indeed, I was lost for a while looking at the blue around. Although the water was not that clear the feeling is still good – looking at the things that you don’t often get to see. I remember I asked my dive instructor, Leon, about the block structures I saw when I went to Pulau Seribu with my friends earlier of this year. At first, I thought those blocks were there by accident – like dropped from the sky or from somewhere? But when I looked at the numbers then they must be placed there for a purpose. I can’t remember exactly what he replied but the point is the solid blocks were placed there for the corals to grow. While on that day, the structures that we used for the coral planting was not the same as what I saw the other day. They called it spiders. From the shape of the structure itself and also from how they lay those on the seafloor which forming like a spider web, we shall know why it is called so. They brought it down two weeks before and had already started to plant on the following week. So, we were continuing what they have been doing. 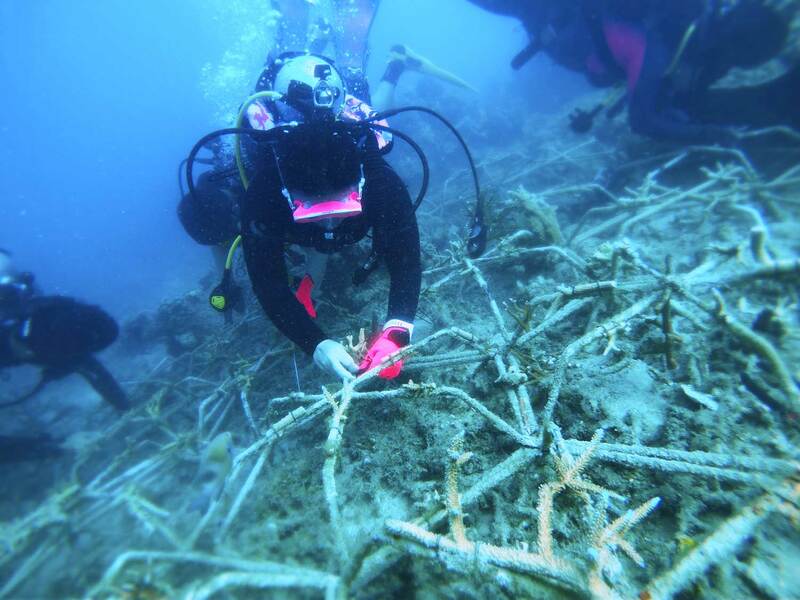 Then, with the corals on hand, we slowly swim heading to the area where all these structures were placed. After brushed away the dirt, we started to tie the coral that has been broken into smaller pieces with the cable tie onto the structure, one by one. If it was done on the ground, it would be a quite easy task. But because it was done underwater, we had to put extra efforts to control ourselves towards the corals, our dive buddies, and our surrounding while doing it. “Okay, I can do this.” I grabbed lightly on the structure with the rescued corals and try to keep my leg down because it keeps going up (I suspect too much fat ~). Meanwhile, try to tie it up with the cable tie, by all means. I personally think that I didn’t do much during the downtime that day. Time passed so fast – super duper fast. Living Seas did the same restoration using the same structures in Bali as well. And they found out that the corals are in fact growing after a month and thriving on the spider structures. They are planning to put more structures down again so that they can rescue more corals. I admire and respect people that have really put their thoughts into this and all their efforts to restore and conserve the coral reefs. I mean, these people are fixing something that may not be caused by themselves at all and protecting something that might not be understood by many people. When something is broken, someone has to fix it. Wouldn’t it be great if we don’t let it break in the first place? Especially when we know that breaking the corals is as easy and as fast as a finger snap. However, to plant it and to see it grows, unfortunately not as fast as that, too. No matter what, I think the planted corals still won’t be the same with the natural ones that grow through the process of a very long time along with this earth. But at least, it still can be restored and be homes for a variety of underwater organisms. If you are interested in taking part in the coral planting or joining the one-day dive trip to Pulau Seribu, please contact Living Seas. If you ask me where I usually go hiking, I can quickly answer you and even let you know about my most favourite mountain and why. But even though I don’t really have an answer to the earlier question mentioned in the beginning yet – because the number of dives I did is still countable with my fingers plus few toes, I do see some changes in my life since I dive. The obvious one is in my relationship between me and my partner in crime. Before I learnt to dive, we usually always stay together when we snorkel; we never ever separate from each other. But without we realize, we started drifting far away from each other. Sometimes I am still holding on him tightly, sometimes I let him loose – I don’t usually behave like that. Until on my last trip, he totally just stayed and watched over me from the boat. He should be very proud of me. I can’t be thankful enough for his patience all these times. I will still keep him by my side. Yeah, my floating device. Today last year, I still didn’t really feel comfortable yet in the water although I often go snorkelling. There are many ways to overcome the fear of water and I think this way works for me. So, if you ask me how I feel now after a year, well, surely you already know the answer. Have you tried to plant the corals before or what do you think about the coral planting? What else do you think we can do to support the conservation? Feel free to share in the comment box below. I would love to know your thoughts! Next articleBunaken & Lembeh: Which One Shall I Go?